So, a couple of weeks ago, I shared the post-baby body fitness challenge I was embarking on with Lean Cui­sine and Couch to 5K! You can see full details in the challenge introduction post (and more info about why I wanted to do this). 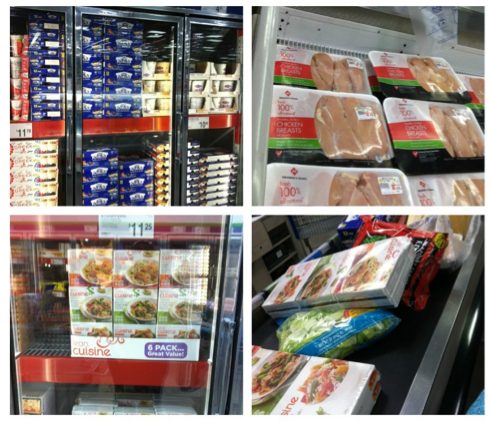 But, here’s a quick recap… I did a “healthy foods” shopping trip to Sam’s Club, where I purchased the Lean Cui­sine Asian Fla­vors 6-packs. The plan was to then replace my at-home lunches each day with one of the Lean Cui­sine meals and also to start the Couch to 5k program. Pretty well! Some areas could certainly be improved upon, but it’s definitely been a step in the right direction. First off, since starting the challenge I’m down 4 pounds! Nothing earth-shattering, but I’ll take it! Plus, it puts me at just below my #3 pre-pregnancy weight (which was my highest weight ever), so that’s good! Having a Lean Cuisine meal for lunch has been a really good change for me. Not only does it help with portions, but it’s such a convenient meal. There were days that I wasn’t eating lunch and then would just end up mindlessly snacking. So, actually having a set meal has been beneficial. Plus, the meals are yummy! My favorite is the Sesame Chicken. 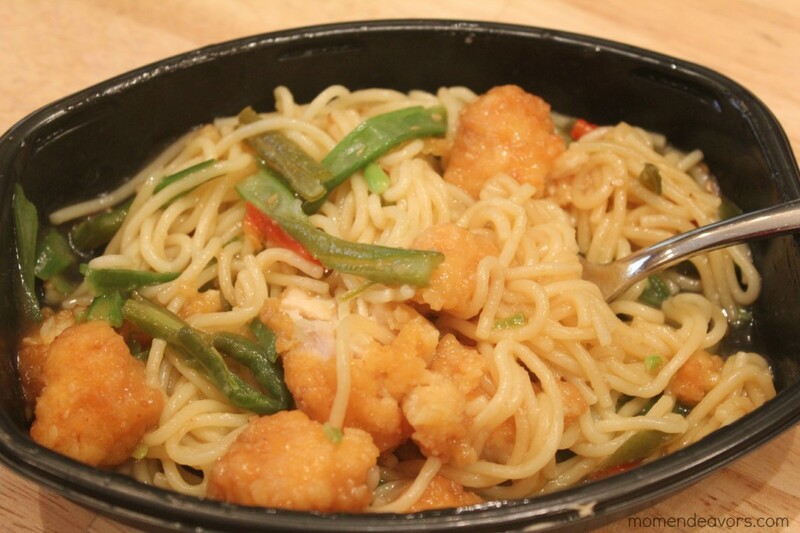 I love the noodles! 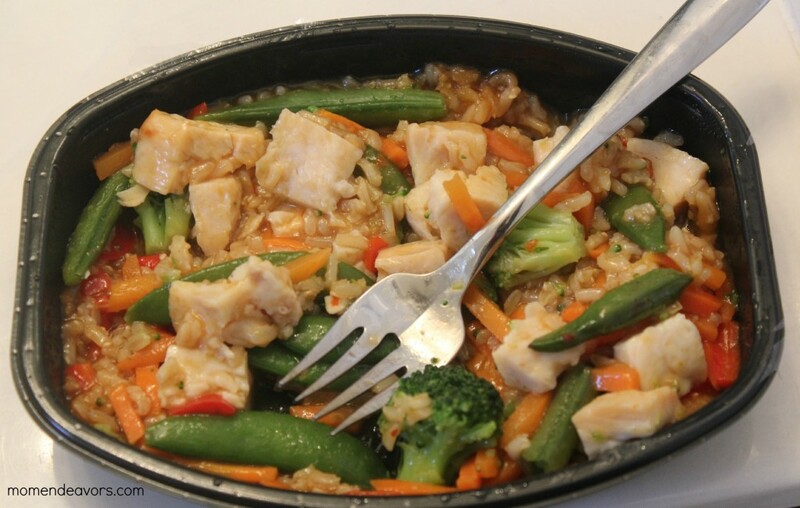 I was really unsure if I’d like the Ginger Garlic Stir-Fry as I tend to not like things with lots of “spice”. But, it’s really good! My 2nd favorite of the 3 kinds in the Asian packs! I think all the different spices/flavors help with not wanting to overeat too. 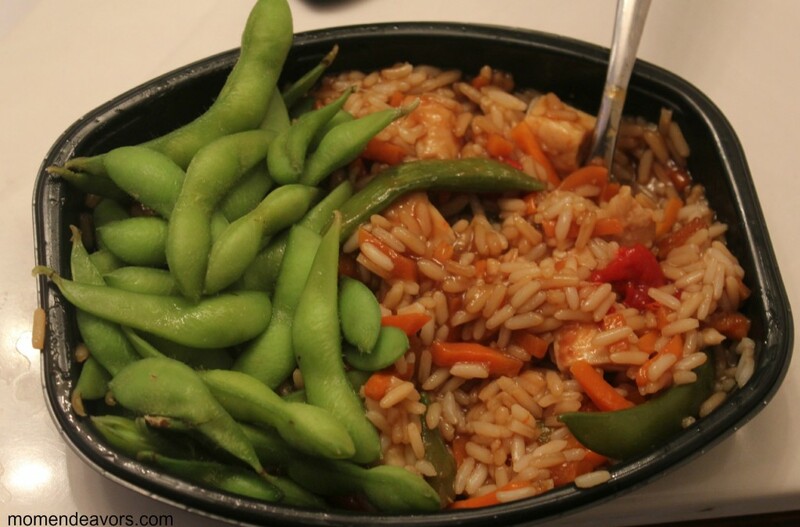 Often times with the meals,I had some of the edamame I purchased at Sam’s as a side. It paired so nicely with all of the meals! 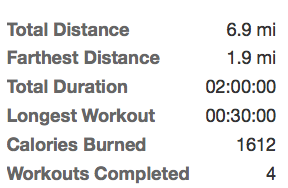 The Couch to 5k program has been going ok also. If I was doing it every other day like I should be, I’d be a bit farther into the program. But, with Baby Brother still having unpredictable sleep patterns and a sick Little Brother, some mornings it just hasn’t worked out. Even still though, I’ve completed 4 workouts and improved my distance each time! So, that’s a good thing! Here’s my data: I love that the program tracks stats for you! And, it’s pretty amazing for me to see how many miles I’ve gone in just a few workouts! Love that! 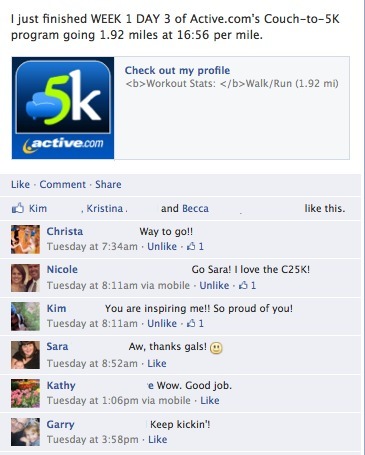 Plus, with the app, I can share my workout on Facebook. At first, I hesitated to do that. I thought it might be annoying to others (and, let’s face it, my time/pace is sad). But, I did it anyway and am so glad I did. People’s comments have been so encouraging. So, by posting, it helps keep me accountable & motivates me to do it again! 🙂 I’ve been going early in the mornings before Mr. Mom Endeavors leaves for work. That seems to work best for us. The first day, I tried going with the kids & stroller, but that didn’t work as well! So, I called that just my “trial run” and redid that day. We’ve got a great path right by our house and I already have developed a “route”. 🙂 My favorite thing has been that the last few mornings, I’ve need long sleeves because it’s actually chilly! So, all in all, I’d say the challenge has been going well. Having healthy, convenient meals on hand has been great, as has pushing myself to run. So, I plan on keeping it up! I’ve been sharing some of my meals & my “runs” on my instagram & twitter (momendeavors on both sites!). So, you can follow along on my journey there. You should also go check out how Always Expect Moore and The Grant Life did with the challenge. For more info, you can fol­low the #Frozen­Fa­vorites hash­tag on twit­ter and check out Lean Cui­sine on Face­book and Twit­ter. Dis­clo­sure: I am a mem­ber of the Col­lec­tive Bias™ Social Fab­ric® Com­mu­nity. This shop has been com­pen­sated as part of a social shop­per insights study for Col­lec­tive Bias™ and (Nes­tle) LEAN CUISINE #CBias #Social­Fab­ric #Frozen­Meals. How­ever, all opin­ions and expe­ri­ences are entirely my own. Sara! GREAT JOB! You are such an inspiration!! !